Soon after the D-Day landings, the 1st Battalion, 143rd, commanded by Lt. Colonel Fred L. Walker, Jr., and troops of the 133rd Field Artillery were withdrawn from the Paestum sector to reinforce American Rangers at Chiunzi Pass, a vital gateway across the rocky Sorrento peninsula. From the pass artillery shells were dropped on German mortar positions at the foot of the mountains. These troops, which remained in the line almost two weeks longer than the remainder of the Division, greatly aided the British Tenth Corps in its sweep into Naples and the drive up to the Volturno River. 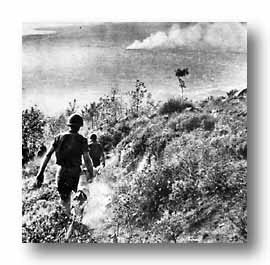 MEDICS FOLLOW THE BATTLE DOWN INTO THE SMOKEFILLED NAPLES PLAIN, FAMED MT. VESUVIUS IS ON THE RIGHT. 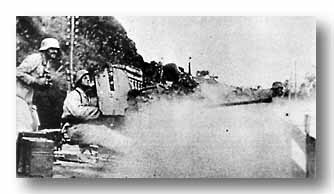 CAPTURED GERMAN FILM shows how the nazis observed the Salerno landings from their positions on the mountains overlooking the beaches. A mountain-ledge road offers good vantage, looking out upon Salerno Bay. HEAVY COASTAL GUN is directed seaward. Allied naval gunfire and bombings took care of the enemy's big gun emplacements. AN ACK-ACK CREW from hillside position tries to hold off invading ground troops.